Visit Old Town San Diego CA, and check out the new and old happenings. It's a great place to spend an afternoon. You can have some old fashioned fun, drink a lemonade, explore old buildings, have dinner outside, and so much more. There is so much to see and do. Before we get started let’s take a look at a little history of how it all began. The Kumeyaay were believed to be the earliest people living in San Diego dating back approximately 9,000 years ago. As the Spaniards began to arrive and settle in 1769 the Kumeyaay retreated to the hills to what we now call Old Town San Diego CA. It has been said that Juan Rodriguez Cabrillo referred to the native Indians as “good natured and attractive people.” Old Town is considered to be the “birthplace” of San Diego. It is also home to the first mission, San Diego Presidio, of the 21 built as the first colonization of California. The Presidio was founded by Captain Gaspar de Portola in 1769 and strategically located atop a hillside overlooking what we now know as Old Town. 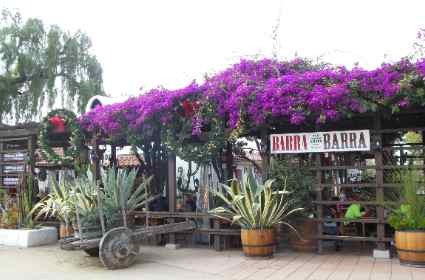 Coined with the name of El Pueblo de San Diego in 1835, this historic little town was established. The American flag was raised in the Old Town San Diego Plaza in 1846 by a U.S. Navy Lieutenant and a Marine Lieutenant. California received statehood in 1850 and up until that time Old Town San Diego continued to be the primary place for commercial and governmental happenings of the people. Most considered it to be the very nerve center prior to 1860 and the establishment of down town San Diego. Coined Old Town State Historic Park in 1968 by the State of California Department of Parks and Recreation, there are many place to see and explore including the main plaza, exhibits, museums, restaurants and more. Old Town San Diego CA is a historic landmark in San Diego California, where the original San Diego downtown developed before the Gaslamp Quarter. Things to Do - Explore the State Historic Park, dine at one of the many outdoor restaurants, see the historic shops and buildings, see a ghost at The Whaley House or Cosmopolitan Hotel, ride the Trolley to Old Town. Where is Old Town San Diego? Old Town is located near the junction of highways 5 and 8 in San Diego CA. Food: Choose a nice Mexican dinner at an Old Town San Diego restaurant, such as Casa de Reyes, where you can get great Mexican food. There are also some great happy hours. Families will love the old fashioned root beer and candy store in Old Town San Diego SHP. San Diego Old Town Lodging - Check out our suggestion for hotels in Old Town San Diego below. Consider staying a day or two since there is so much to see and do. Here are some popular hotels. Old Town Inn San Diego - Check out Old Town Inn San Diego as one of your choices for hotels in Old Town San Diego. It is located at 4444 Pacific Highway, San Diego, CA 92110. Make your reservations by calling (800) 643-3025. It is conveniently located across the highway from Old Town National Park and the Old Town Trolley Station. It makes commuting to most any San Diego attraction a breeze. 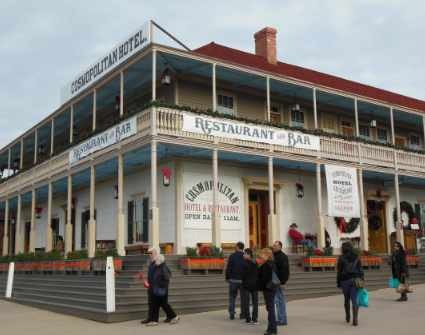 Cosmopolitan Hotel and Restaurant Old Town San Diego – From 1829 to 1860 this was the home of Juan Bandini and his family. Purchased in 1869 by Albert and Emily Seeley the second floor was built and became the Cosmopolitan Hotel. It also served as the Casa de Bandini Restaurant which is now located in the Forum in Carlsbad, California. It is famous for the folklore of a woman clothed in a long dress that glides along the balcony and through doors that have been sealed for many years. It is also said that for unknown reasons the lights flicker and go on and off on their own. With the 3-year and $6.5 million renovation, it is a great place to stay and is conveniently located in the heart of Old Town. Join them for Happy Hour between 3-6 p.m. each day. Cosmopolitan Hotel and restaurant is located at 2660 Calhoun Street, Old Town San Diego, CA 92110. Phone number (619) 297-1874. The Alvarado House – Once coined as a house of disrepute for selling liquor and disorderly behavior by its male patrons. The house was reconstructed after 1874 due to the adobe deterioration. The building is now a park concession. 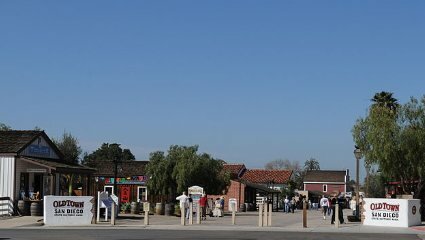 It is located at 2720 San Diego Ave, Old Town State Historic Park, Old Town San Diego, CA. Casa de Aguirre – This was one of the first adobe houses built in Old Town just prior to 1868 by Don Jose Antonio Aguirre, who was one of the largest landowners in California at the time. Seek and you will find that this adobe harbors a love story of two sisters. Go ahead and google it - Two Sisters and the “Saint” The Love Story behind Old Town’s Casa de Aguirre. It now serves as a retail store and small museum. Located on San Diego Avenue at Twiggs Street. Casa de Estudillo – This particular adobe was constructed in 1827 by Jose Maria Estudillo and was considered one of the finest houses in the area. It was the novel, Ramona, by Helen Jackson that brought popularity to this home. It was a front-page article on the San Diego Union that put Casa de Estudillo in the spotlight with tourist flocking to Southern California to see the locations mentioned in the writings. The fiction novel depicted that the Estudillo home was the “Ramona Marriage Place.” The house fell to disarray as people capitalized from its fame. A much-needed renovation was completed in 1910 by architect Hazel Wood Waterman to restore the home back to the descriptions mentioned in the novel. Its final acquisition was by businessman Legler Benbough who donated it to the State of California in 1968. Casa de Lopez – This adobe was built in 1835 by Juan Francisco Lopez and was also known as Casa Larga, or Long House. It is located at 3890 Twiggs St. on the west side of the right entrance to restaurant, Old Town. Casa de Pedrorena – This home is located at 2616 San Diego Avenue, Old Town San Diego State Historic Park. It was the home of Miguel de Pedrorena and built by his son in 1869. It remained a family residence until the 1890s. It was restored in 1996 and is now a park concession. Casa de Wrightington – This adobe residence was built in the early 1830’s and was owned by San Diego Presidio soldier Damasio Alipas and his wife Juana de Dios Machado de Alipas. Upon his death the property was passed on to Juana. She remarried Thomas Wrightington who served as justice of the peace, alcalde (mayor) and sheriff. The adobe house was reconstructed in 1985 and is now a park concession. It is located at 2769 San Diego Avenue, Old Town State Historic Park. Casa Machado Silvas – The Casa Machado Silvas house was built between 1830 and 1843 by Jose Nicasio Silvas and it stayed in the family for over 100 years. It would eventually be used as a boarding house, saloon, restaurant, art studio, souvenir shop, museum and church. Casa Machado Y Stewart – Originally built as an adobe home in 1830 by Jose Manuel Machado. It was family occupied and eventually Jose’s daughter, Rosa and her husband Jack Stewart lived there as well. Descendants of Jack Stewart, up until 1966, inhabited the house. It was restored in 1973 and converted into a house museum representing a Mexican era adobe. Church of the Immaculate Conception – Located at 2540 San Diego Ave., Old Town, San Diego, CA 92110, Phone (619) 295-4148. Daily Mass is Mon – Sat at 8:00 a.m. and Sat vigil at 5:15 p.m., Sun morning 8:30, 10:00, 11:30 and Sun evening at 5:15 p.m., First Friday Mass at 8:00 a.m. with Celebration of the Anointing of the Sick followed by Exposition of the Blessed Sacrament, Sacrament of Reconciliation is Sat 4-4:30 p.m. & by appointment. Although Old Town received its first resident pastor in 1848, Father John C. Holbein, C. SS. CC. and he remained until 1854, laying the first cornerstone for the Old Adobe Church in 1858. It wasn’t until 1868 however that the cornerstone of this historic church was laid by the Right Reverend Thaddeus Amat, C. M., on July 10th under the administration of Father Antonio Ubach. El Campo Santo Cemetery – With ghost stories abundant, it is believed this cemetery was established in 1849 and is the second oldest private cemetery in Southern California. It was restored based on photographs and descriptions in 1933 by the San Diego Historical Society and is sure to offer a most interesting visit. The location of the cemetery is 2410 San Diego Ave., Old Town San Diego, CA and phone is (619) 220-5422. With history abundant you are sure to have a full day of fun and exploration in Old Town San Diego. Here is a list of more of the historic sites you will want to get out and see. All are conveniently located within walking distance but you may want to wear your comfy shoes since you will be there a while.